Below is County Map of Lassen in California showing the boundaries, roads, highways, towns and much more. Incorporated in 1864, Lassen County is located along the California–Nevada state line in Northern California. The seat and the only incorporated city of the county is Susanville. The county extends over a total area of 4,720 square miles. The Warner Mountains cover the northeastern corner of Lassen County, while part of Lassen Volcanic National Park extends into western Lassen county. The national park features steaming sulfur holes, meadows covers with wildflowers, clear alpine lakes, and numerous volcanoes. The 3,187-meter-tall Lassen Peak in the Shasta Cascade region is the centerpiece of the entire wilderness of the park. Recreational activities around Honey Lake, near the Nevada border, include birdwatching, picnicking, hiking, camping, fishing, and waterfowl hunting. Campgrounds in Eagle Lake Recreation Area and Susanville Ranch Park are popular spots to spend a relaxing vacation during the summer. 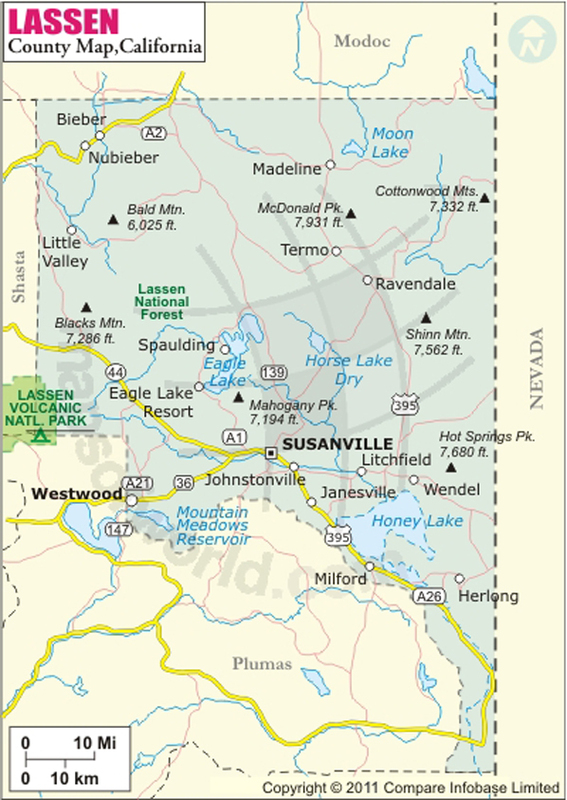 Susanville, a former logging and mining town, is home to two state prisons: the California Correctional Center and the High Desert State Prison, California. Susanville lies at the intersection of State Routes 36 and 139. US Route 395 traverses the county from north to south.